The Jeanne Sauvé Foundation derives much of its strength from its unique setting at the heart of the multidimensional cultural and academic communities to which it belongs and contributes. Since 2012, the Foundation’s partnership with Concordia University has brought a new vibrant dimension to its programming. 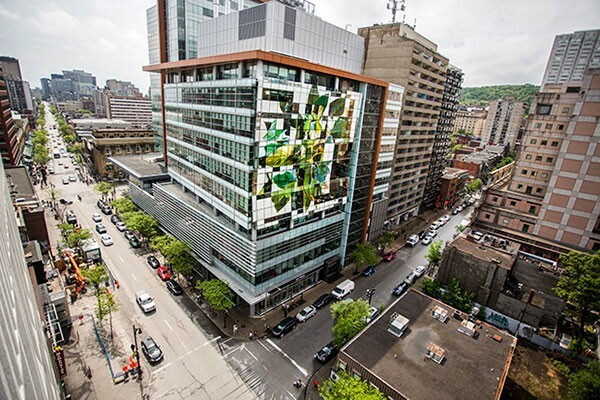 The Quartier Concordia, within a ten-minute walk from Sauvé House, is the urban campus home to many Arts and Sciences programs, the visual arts, John Molson School of Business, and Engineering and Computer Science, as well as the Mel Hoppenheim School of Cinema – the largest, university-based centre for the study of film animation, film production and film studies in Canada. Every year, our scholars, facilities and city inspire 47,000 students to engage with big questions head-on. We’re a comprehensive university. We search for innovative solutions and make positive contributions to society. Our creativity powers Montreal and connects us to the world. Concordia- the name comes from the motto of the City of Montreal, Concordia Salus, “well-being through harmony”- was created through the merger of two institutions, Loyola College (1896) and Sir George Williams University (1926). Of particular relevance to Jeanne Sauvé Foundation program participants is the School of Community and Public Affairs which offers a unique interdisciplinary education to undergraduate and graduate students in publicpolicy analysis and advocacy and community and economic development, respectively. Since 1979, the School, particularly through the work of its students, has been a catalyst of public policy discussion and debate both locally and globally. Concordia has expanded rapidly over recent years to accommodate its more than 47,000 students, over 12% of whom are international, and come from some 150 countries. Today, it offers 300 undergraduate programs, 195 graduate programs, diplomas and certificates and 35 postgraduate programs. Non-credit programs are offered by the School of Extended Learning. Research-creation activities take a wide-spectrum approach to social issues, industry needs, cultural diversity and science and technology. From environmental sustainability to human health and well-being, Concordia’s researchers are making major contributions to new knowledge. New buildings include the twin-towered Engineering, Computer Science and Visual Arts Integrated Complex, and the stunning 15-storey John Molson School of Business building which was awarded Leadership in Energy and Environmental Design (LEED) certification as a high performance green building. Seven kilometres away, in a quiet residential neighborhood, the Loyola campus is home to the performing arts, and Communication Studies and Journalism. It features a mix of early 20th century gothic-style buildings and state-of the art additions including the Richard J. Renaud Science Complex and the 570-seat concert hall noted for its superb acoustics and named for Montreal’s jazz great, Oscar Peterson. The student body is as dynamic as it is diverse and is often found at the forefront of social issues. There are countless associations and clubs serving every academic, advocacy, social and cultural interest – and should none suit your needs, it is easy to start a new one.